Water from the Central Arizona Project canal terminus feeds into Basin 1 at the Pima Mine Road Recharge Project. 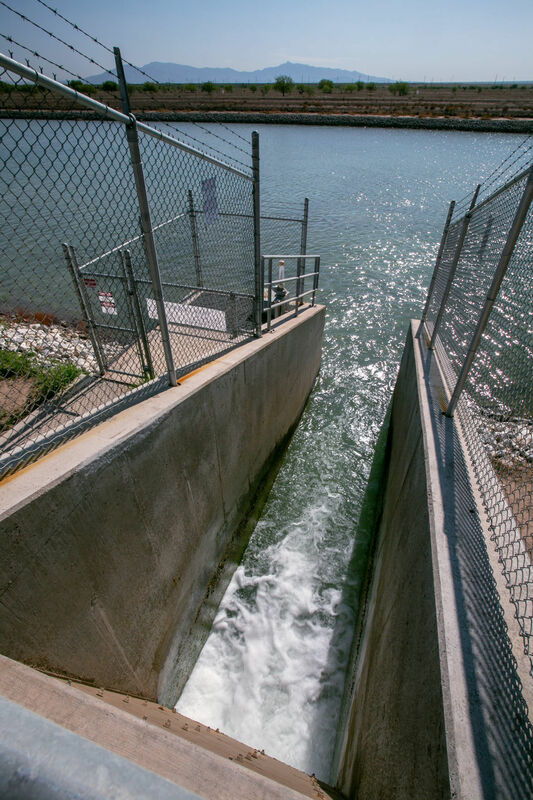 Nearly 3.6 million acre-feet of water is stored in 28 sites across the state. The $7.8 million Pima Mine Road Recharge Project, which has five basins, is 15 miles south of Tucson. Water gushes into this basin from an underground vault. Then, it seeps into loosely packed sands and gravels underneath. The Lower Santa Cruz River recharge site for the water bank sits in the Marana area. It’s “a matter of working through challenges. We’ve heard loud and clear, from cities particularly, that they want better clarity for decision making,” he said. “Water-bank recovery is one of major strategies this state has adopted to mitigate impacts of a river shortage,” he said. A likely success story is CAP’s $7.8 million Pima Mine Road Recharge Project, containing five basins, totaling 37 acres, about a mile and a half east of Interstate 19. Last week, the Star and Arizona Public Media visited one basin, elongated and rectangular-shaped, looking like a giant swimming pool, surrounded by desert. It is 15 miles south of Tucson, and 2.5 miles east of where CAP’s underground steel pipelines end the project’s 336-mile run from the Colorado River. Water gushes into this basin from an underground vault. Then, it seeps into loosely packed sands and gravels underneath, materials that CAP officials say made this an ideal geologic recharge spot The water infiltrates at about 3 to 5 feet per day, taking about 10 days to reach the aquifer. Arizona Daily Star reporter Tony Davis and Arizona Public Media reporter Vanessa Barchfield are collaborating this year on To the Last Drop: Planning for Water Shortages, a project examining Arizona's water future. Barchfield's reports will air on Arizona Spotlight starting this weekend. Arizona Spotlight airs Fridays at 8:30 a.m. and 6 p.m. and Saturdays at 5 p.m., on NPR 89.1 FM or 1550 AM. Why disputes over Colorado River reservoir operations and a proposed drought management plan matter to our water supply.